It was my birthday yesterday, and it was great! Thank you everyone for all your messages! I had a pretty relaxing day. I ate a bagel, watched my favorite episode of Viva La Bam, saw some raccoons playing, had an amazing homemade dinner, played Knuckles Chaotix and a bunch of old Genesis games on 32x and EXPLODED GLASS ALL OVER MYSELF. All in all, it was awesome, and I picked out a fun nail and eye of the day. 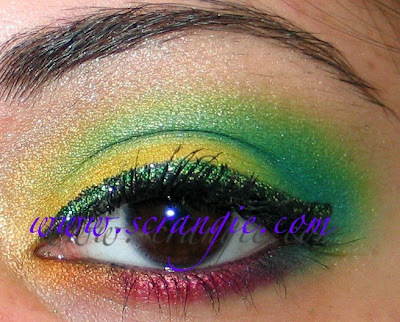 A rainbow eye! My eyeliner is all messed up. I tried for half an hour to put on a pair of fake lashes and I couldn't get them on right. The inner corner wouldn't stay down. I got frustrated and took off both strips, so I had to cover up all the spots where my shadow was messed up and my eyeliner was smudged with Blacktrack Fluidline. That didn't look very good, so I put green glitter over it. I didn't really like the green glitter much, either. Wish I didn't try to use the lashes. Boo. Oh well, I still liked it even with messed up liner. I couldn't decide on a color for my nails, so I did something I never do- I matched my makeup. OPI Girls Just Want To Play, OPI In My Back Pocket, Obsessive Compulsive Cosmetics Traffic, Nubar Hot Green and Color Club 220 Volts. I actually really loved this 'skittles' look, I think I'm going to do 'skittles' manis more often. Happy belated birthday, Scrangie! :D I like all those colors together! Happy belated birthday, from me too :)! It sounds like you had a fun, relaxing day...the best kind of birthday! Cute look, and I think the skittles are awesome! That would look really cute on toes too. Happy (late) Birthday Scrangie! I laughed so hard when you said you saw raccoons playing. haha. I love your make up and the nails are awesome! happy belated birthday! Great makeup, and the skittles look awesome! I love the eyes!!! Beautiful! Happy B-day too! Your makeup is awesome! You look great, happy late birthday! Happy (belated)Birthday wishes to you! I agree, that skittles look is great fun. That mani is fun and colorful but that eye makeup (messed up liner or not) is just... woooah! Love it! I read your blog every day and honestly, you caused me to buy about three quarters of all my nail polishes. and without you, maybe I never would have worked up the courage to wear bright shades like turquoise or unusual ones like grey or taupe/mushroomy colors. only sometimes I really, really envy you, because you can get so many American nail polishes which we European girls never have a chance to get. nevertheless, your blog is great and I love your photos and comparison swatches, they have been dead helpful! Happy Birthday! Sounds like a great day. And the eyes have it! Birthday bonanza will be on the way tomorrow. Is that popcorn you're holding?! A big birthday hug to you Scrangie. You should have said something and our wishes could have been on your birthday! Love your eye makeup. It's totally outrageous and gorgeous. Matching nails are one and the same! Did you plan the popcorn before or after! What the heck was the exploded glass about? Wish I had some matching birthday cupcakes to send you. Your nails look so beautiful. I'm singing Happy Birthday to you, hope it's not too bad. Melli, thanks!! I was thinking of doing a pedi as soon as I finished the mani, haha! Nina, lol thank you! They were so cute! Anna, haha, thank you! Skittles rock! Izumi, thank you so much! Lucy, thank you!! I love outrageous! I got the popcorn first, and then did the mani without thinking about it, and then I remembered I had the popcorn and thought, "This is PERFECT!" lol :) And the glass... My brother got me a nice cigar in a glass tube and I was trying to open it and I think I was holding it a little too hard >.< The glass tube shattered and glass flew EVERYWHERE! In my shirt, in my hair, lol it was scary! I didn't get cut at all, shockingly! Happy Belated Birthday! And I LOOOOVVEEEE the make-up and manicure! I absolutely love love love rainbows and your make-up and mani is just amazing. 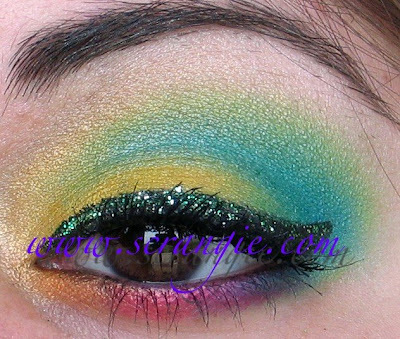 Love this look...you are excellent with the eyeshadow...too hard on yourself. It looks great...wish I could do that. Happy belated birthday, Scrangie, your eyeshadow skills are unparallelled! Happy belated birthday, I really dig the makeup as well as the skittle nails, the eyeliner is wicked gorgeous. Happy belated birthday! Love both your Skittles and your eye look! I love your take on the rainbow eye! :D Gorgeous skittles too.. what a yummy post! I think the Skittles are too cute! Happy Birthday! Love the skittles. Which episode of Viva la Bam? I love love love the skittles!! I want to do it too, I need to get one of those greens, and I want so much to find a yellow that looks good on me. a lovely parrot with m&m's ?? I'm currently obsessed with OPI"S "I don't do dishes" it's a great opaque reddish pink! I love your rainbow mani! Are there substitutes you can suggest for the green and yellow polishes? I want to recreate the look, but I would like to buy the polishes from one polish e-tailer. If you could reply, I'd really appreciate it and I love your blog! The eye makeup and the nails look really good. Best thing about is that they both seem quite wearable.